The Porta Brace CTC-3 Traveler Camera Case (Camouflage Mossy Oak) is a 1000 denier Cordura nylon case specially designed to carry professional digital camcorders such as; Canon XH-A1, XH-G1, XL-2, XL-H1, JVC GY-HD251, Panasonic AG-HVX-200, Sony PMW-EX1, HVR-V1U, HVR-Z1U, PD-170,and other professional camcorders up to 22" long. There are reinforced layers of lightweight plastic and thick foam protects the camcorder from normal bumps and everyday handling. The Slip-not bottom adds an extra layer of protection against water, dirt and grime with an easy wipe-off surface. The viewfinder cavity has an extra measure of protection for the viewfinder. The long pocket under the viewfinder area holds tapes, batteries and even some battery belts. The case has 1.0" thick foam padding, reinforced by plastic on the front and back sides. The CTC-3 has a zipper facing that has been added to keep the self-healing, heavy duty, YKK zippers from accidental damage (and if you leave the case out in the rain less water is likely to migrate into the main compartment).It has front pockets for extra batteries, tapes an AC power supply or ,tripod plate, rear zippered, mesh slip pockets airline tickets, maps, cable, white balance cards or other flat items, a large interior mesh slip pocket and a small mesh pocket for battery or cell phone. It is carried by a suede leather shoulder strap and suede covered handgrips. . 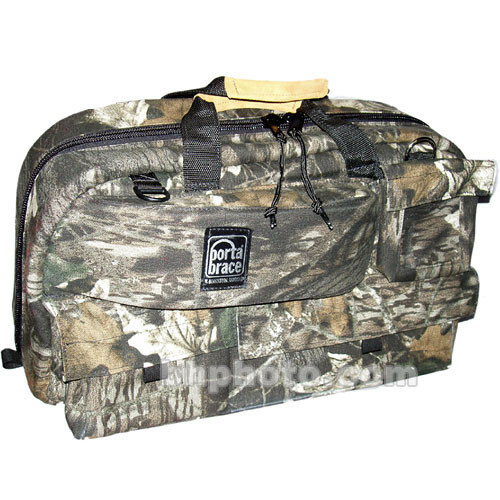 Box Dimensions (LxWxH) 23.3 x 10.9 x 9.9"
CTC-3 Traveler Camera Case (Camouflage Mossy Oak) is rated 4.4 out of 5 by 14. Rated 5 out of 5 by Elwhettohefe from Great Bag Not Always Airline Friendly Bag is great for carrying professional camera and multitude of accessories:AB/Titan/Ki Pro/Exoskeleton/Rugged 500GB's/Cables/RM Litering etc. Bag is used for carry-on of this gear 2-3 flights a week. Yes it will fit in most all larger US commercial airlines overhead bin, but RJ's and Turbo Props are another story, luckily it does fit under the seats provided you dont have to share the space with the person sitting next to you. All in All in does the job and does it well; durable and protective. Rated 5 out of 5 by Rob.R from Awesome Bag I made the mistake to first purchase a cinebag becasue of its so called pockets. The bag broke apart the minute I took it out the box it was delivered and and broke apart in front of the BH rep at the NYC store.. I brought this bag instead and it should have been my first choice. The material feels incredibly strong.. The shoulder strap is perfect and the handles feel great. I can't say enough about this Bag, oh Yeah I have a canon HDV shoulder cam, fits perfectly with room for all the accessories. Rated 4 out of 5 by Gary G. from Worth the Money We purchased two CTC-3's and soon a third for our new Panasonic AG AC 160's. There is plenty of storage for all of the extra equipment. It fits our cameras even with the Anton Bauer ELIPZ 10K 75wh LITHIUM ION BATTERY, Anton Bauer ON CAMERA LED LIGHT 4.5w, ANELEDZ Anton Bauer BASE w/ADJUSTABLE ARM, ANHUBZ Audio-Technica AT875R 7 SHORT CONDENSER SHOTGUN MIC - AUAT875R attached to the camera. How can you go wrong with a Porta Brance? It's worth the money! Rated 4 out of 5 by Lynn from Gets the camera on the plane Bought this bag to carry my HPX-300 onboard an overseas flight because the bag dimensions just barely meet the carry-on requirements, and I couldn't carry the Pelican case on the other end due to size. Bag fits the camera, 2 Dionics 90s, the tripod plate and nothing else. The eye piece well is a nice feature. Bag doesn't offer too much protection, but it gets the camera on the plane. Rated 5 out of 5 by Anonymous from Great Bag I use this product a great deal when I travel. It easily fits in the overhead compartment on larger airlines and while it's slightly more difficult on smaller aircraft, it does fit under the seat. The case easily holds my Canon XHA1s,2 lavalier mics and several Pelican accessory cases. Great layout & holds everything I need! Rated 3 out of 5 by Anonymous from Looks aren't everything On looks and ability to handle the camera it is great. I wanted a bag that would accommodate my laptop too. The pouch is too small even for a 13 macbook. That is a disappointment. I would have liked to have straps on the exterior to accommodate a tripod. It doesn't. I'm reviewing my options for larger bags. Rated 4 out of 5 by Anonymous from Great Case! Fits my Canon XH A1s great! Very professional and stylish looking bag. Pockets to hold camera accessories. Good protection. Only wish it had an extra compartment or two inside the bag. But plenty of room to store most of the extras. Rated 5 out of 5 by Anonymous from very good bag for the XL1 I have a XL1 that needed a new bag. This bag was perfect. Ample room with 16X lens and view finder attached. Also room to store the wide angle lens, extra batteries, charger, tapes, etc. Very comfortable strap. Is this bag good for the SONY FS7? If not, what is a good recommended bag? It depends what you're planning on doing with the camera really. I do own the case and it is set up specifically for shoulder mounts. I have a Panasonic ag-hmc-80 in it. I use that camera for ENG work so I needed a very fast running and gun case. It works well but has very limited storage for any accessories such as batteries, microphones, or on camera lighting. If you're looking for a run and gun case and or not planning on taking a lot of accessories if It works great. (I have not tried it with a Sony FS7) I will try and load up the consumer photo of the case with my camera sitting in it and you can try and size it up from there. For documentary work I use the Sony FS700 with the pelican 1560 case. The case is fantastic you can even carry a laptop with the included lid organizer. Sorry I could not be more help. Will it fit a Sony FS7 with Handle/Mic/Viewfinder/Sony Lens 28-135mm/Base Plate? Yes but I remove the kit lens before carrying because I snapped the kit lens off the camera mouth when transporting via car once. I reposition the viewfinder in case to make it fit more safely. Hope this helps. Nice case and carries my whole cam, lens (on or off camera mount), handle (not taken off), mic (not taken off) and viewfinder (adjusted to fit and not removed).